1. Heat a medium non-stick skillet over medium heat and add nuts, berries, sugar, butter and cinnamon. Stir constantly with a rubber heat-proof spatula for approximately 5 minutes (less time if your nuts are chopped as pictured) until the nuts are evenly coated in the melted sugar/butter. 2. 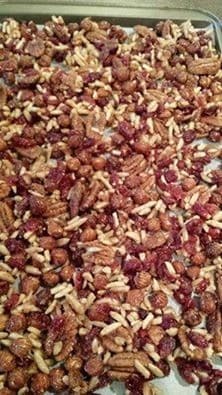 Immediately transfer nuts to parchment paper and immediately separate using 2 forks OR let the nuts harden together and break them apart with your fingers once cooled. The nuts and coating will harden in 5-7 minutes. Notes: *If using chopped nuts, don’t chop them too small or they will burn.